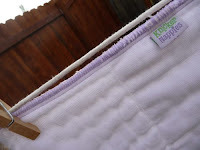 Hesitant to use prefold cloth diapers, What's holding YOU back? I don’t know why I’ve always been so resistant to using prefold cloth diapers. When my husband and I decided to use cloth diapers with our first child my image of prefold diapers was one that would have looked like a scene from Little House on the Prairie. Ma and Pa sitting around a dimly lit house holding a new babe wrapped in swaddling clothes with a cloth folded against his skin and held together by huge pins. No thank you. I decided that I much preferred the modern cloth diaper. The kind with fancy pockets, snaps, hook and loop closures and cool inserts. No old fashioned cloth diapering for me thank you very much. It’s the 21st century, get with the times! No one likes to admit when they’re wrong but in an effort to show some humility I will admit that I was wrong. There is nothing old fashioned about flats or prefolds. I was incorrect in assuming that they would lack the ability to hold my child’s secretions just because they were the tried and true form of diapers for centuries. I’ve recently started trying a few different folds for photo tutorials on my daughter who’s eight months old. I’m completely new at doing anything with a prefold so it takes me longer to put one on than the prefold experienced mama. Once it’s on, I don’t want to undo all that work that I’ve just done so I’ve used a cover and kept it on until the next diaper change. I love the trimness of the prefold and was pleasantly surprised that it was absorbent. It makes sense though that in an age where most of us are moving towards a holistic and natural approach to our living that the tried and true prefold would be a good choice for the modern day cloth diaper user. What do you think? Do you use prefolds? Flats? If you don’t, what’s holding you back? I do use prefolds on my six month old because I spent my diaper budget on my 21 month old's fitteds. :) I really, really like the prefolds though. I'd love it if you'd share some of the videos you like with different ways of folding! Prefolds were the first diaper I tried because they were all I could afford with the gift money my mother sent us before ds was born. They intimidated the heck out of me and I watched HOURS of videos on how to use them. But with no other options, it was sink or swim. LOL! By the time I had money to buy an exclusive pocket stash, I was so suspicious that anything could work as well as my beloved prefolds had for the first 3 months that I bought another 2 dozen in the next size up just in case the pockets developed issues. I still keep them around a year later, and absolutely adore them. I saw it on a blog somewhere and they just made them look so comfy and different how I imagined them. Our baby ended up being wayy too small for "conventional" cloth diapers and many of a time have I had her in these. Adorable! Our mothers did not have the choice they have today when choosing cloth diapers. It involved folding, pins, plastic covers, and a lot of frustration. Many of us have simply switched to disposable diapers because they’re more convenient.